Janome DC2015 is a high quality sewing machine. It is slightly different from other DC machines rolled out by Janome. This time the difference is not just in colors. Sewing start/stop and speed control slider. Every year Janome comes with a DC series machine with the year as model number. This has been the trend since 2010. All DC series machines were good quality, high performance machines (that is the reason why they made it a habit of rolling out a new model every year under the year number). However the main drawback of these machines were that there weren’t a lot of changes. For eg: If you take DC2013 and DC2014, the only change was in color, all other features are exactly the same (same was the case with DC2012). There were even a considerable difference in price across each model (that too just for a different color). Year 2015 has arrived and it seems Janome has tried something different. Janome DC2015 is the most unique of all DC series machines. It comes in bright red color and there are a few changes in features as well. DC2015 has 60 built-in stitches including 6 one-step buttonholes (remember DC2014 had only 50 built-in stitches and 3 one-step buttonholes). DC2015 is a full fledged computerized sewing machine. There are lot of changes when compared to other DC machines. The LCD screen has gone larger and stitch navigation button has changed. The workspace on this machine is pretty impressive, it measures 6.2″ x 4.7″. The machine comes with an automatic needle threader for easy threading. Top drop-in bobbin with clear cover is nice for keeping an eye on the thread supply. Reverse sewing button though small, is conveniently placed. Thread tension is automatic, but it can be overridden. The maximum stitch width is 7mm, which is pretty good for a machine at this price. The maximum stitch length is 5mm. 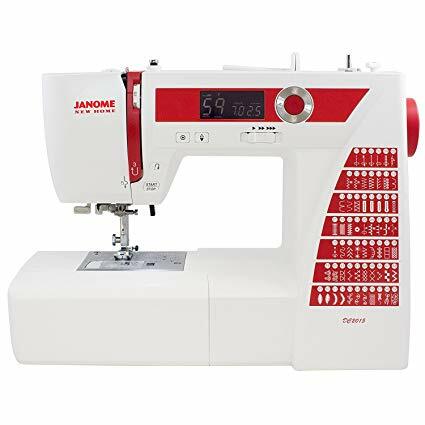 The feed system is 7-point, which is really good to ensure consistent stitch quality ( I wonder why Janome didn’t use SFS for this machine, it does make a slight difference in stitch quality). Janome DC2015 packs advanced features like programmable needle up/down. This is essential for quilters. The needle is set to finish in down position as default. You can change it to up position for pivoting or other stuffs. The machine is free arm and drop feed convertible. A total of 15 needle positions are available on this machine. There is an easy to use locking stitch button, with which you can lock the stitches at the beginning and end with just the push of a button. Since the inside frame of Janome DC2015 is made of metal, the machine is slightly on the heavier side. It weighs 18.2 pounds. An extra high presser foot lifter offers more clearance while working with multiple layers of fabric. Presser foot pressure can be manually adjusted. Like all other DC series machines, Janome DC2015 is an excellent performer. It also has the luxury of few extra stitches as well. The operation is pretty quiet. Even impressive is its performance with denim. It doesn’t seem to struggle at all, even if you throw 8 layers of denim at it. The speed control slider gives you good control over the sewing speed. The build quality is excellent and it doesn’t look flimsy at all. The machine is very easy to thread and use. I don’t think beginners will have any trouble using this machine. Overall, I am very happy with the performance of the machine. The automatic needle threader needs couple of attempts to get used to. Other than that, I am pretty satisfied with the machine. Yes, especially when you consider the price. Currently there is not a lot of difference between the price of DC2015 and DC2014. So to get a better featured and updated machine at the price of an older version is pretty cool. You won’t be complaining about the quality of the machine for sure.